Saudi Arabia denounced US President Donald Trump’s recognition of Israel’s 1981 annexation of the Golan Heights, a statement released by the Saudi Press Agency. The statement “Attempts to impose fait accompli do not change the facts,” the statement said. It said the Golan Heights was an “occupied Syrian Arab land in accordance with the relevant international resolutions”. Inside sources suggest the Saudi regime is concerned with its image in the Muslim world and feel that Saudi must be more active in combatting the oppression of its neighbours by Israel. 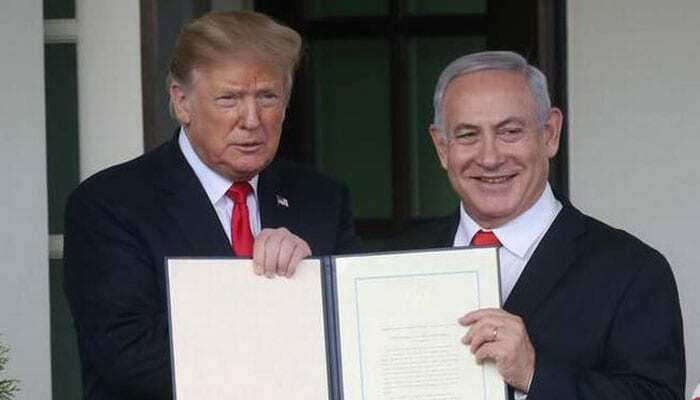 Trump, with visiting Israeli Prime Minister Benjamin Netanyahu during a visit to Washington, signed a proclamation on Monday officially granting US recognition of the Golan Heights as Israeli territory. Israel shut down its main crossings into Gaza and imposed restrictions on fishing off the Gaza coast, whilst carrying a blitzing air rade on the Gaza strip. So far the Saudi’s haven’t suggested how they will react or if indeed they will. However, this move has outraged millions of Muslims around the world, who see Israel as the aggressor in the region, supported by the US.